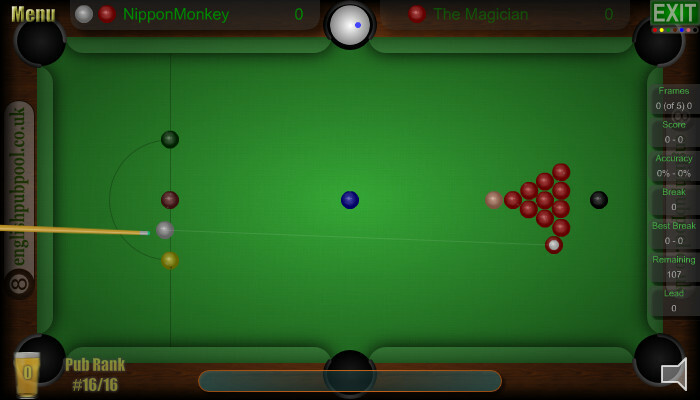 Pub Snooker, the free flash snooker game with snooker Tournamants, Challenges and Time Attacks. Make big breaks and become the Pub Champion - Are you good enough to be rank #1? Pub Snooker, the free flash snooker game with excellent AI computer players. Play against your mates at home or against the computer in Tournaments and Challenges. Enjoy! Snooker Loopy - The Best Snooker Song Ever! Play on the official facebook app. Play more pool games on englishpubpool.co.uk, play UK 8-Ball Pool, World 8-Ball Pool, 9-Ball Pool and Snooker games. Play Pub Snooker! One of the best and most complete flash snooker games on the web! With lots of Snooker Tournaments, Snooker Challenges & Snooker Time Attacks. It's snooker on a pool table! Play Snooker Tournaments against the computer. Win the snooker tournaments to unlock more cups and to improve your Pub Ranking. Play 2 Snooker Time Attacks. Top score Leaderboards for all of the challenges and snooker cups. Compete against your friends to see who rules the table. Play 2-player matches against your mates at home. Win over 50 Trophies for top scores, big breaks and special shots. Excellent billiards physics with realistic cue ball spin control. You can play spin shots to keep position and make big breaks. AI CPUs can play for position (try to get the white ball in a good position for their next shot) and can play safety shots too. It has a colour coded aiming cursor, so you always know which ball you can hit/pot. Accurate snooker rules - for the snooker geeks, there are no misses called & no touching balls too, but the rest of the standard snooker rules apply. Pub Snooker was developed by Nippon Monkey for englishpubpool.co.uk and pubsnooker.com. © 2010-2019 Matthew Morley. All Rights Reserved.